This weekend’s Di Candilo Steel City Roof Off Roar is so named because the Late Model teams will remove the roofs from their cars in a radical change up to the norm. While the concept is something of a novelty, Late Model front runner Michael Holmes said it makes for subtle changes to the aerodynamics of the cars. “Having the roof off makes the cars a little tighter as more wind gets on to the deck and the rear wing which creates more down force,” he explained. “People would be surprised how much ‘aero’ is on a modern Late Model. Sprintcars have wings but the whole body on a Late Model is designed to create down-force. The Di Candilo Steel City Roof Off Roar is a 40 lap feature race, which Holmes said makes tyre choice and race set up vital. “This will be a great event for the fans,” he said. “With the roofs off you can see right down into the cockpit and get a feel for how much (steering) wheel work it takes to muscle one of these cars around the Motorplex. Holmes has enjoyed a great season so far, enjoying a consistent run of strong results. “We really got going mid-November with a win and a string of podiums,” he said. 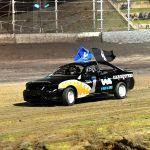 Hot on Holmes heels is fellow Late Model Driver Joe Chalmers he believes he is his own hardest critic when it comes to his racing, so he will have something to prove to himself for this Saturday’s Di Candilo Steel City Roof Off Roar at Perth Motorplex. “This season has been surprising,” he said. “So far we have had some good results and started running a little more towards the front. I’d love a podium somewhere before the season’s out. “I’m my hardest critic, if it doesn’t go right or to my expectations I then try to work twice as hard to make it better next time out. 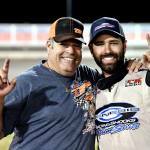 Like many in the Late Model field, Chalmers will be racing with his heart on his sleeve following the passing of legendary driver Bert Vosbergen. As far as the novelty of taking the roof off goes, Chalmers said he does not see much difference once the green flag waves. “I hardly notice it while I am racing, but I do in pre-race as it opens up my vision a lot more. “Every division needs a cult event, like the Sprintcars have World Series. For Late Models to have such an event where the average person in the crowd notices a difference is great for the sport and for Late Models. “Personally I’d like the races to be 40 or more laps all the time. It seems to suit me better as we can chip away and try for better results.” Will that be enough for Chalmers to claim victory? 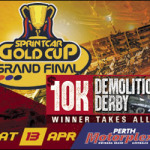 Don’t miss any of the action this Saturday night at The Di Candilo Steel City Roof Off Roar which will also feature Limited Sprintcars, Pool Shop Group Speedcars, Telf Promotional Products Formula 500s, Junior Sedan and the first ever running of demo cross – a radical combination of demo derby cars and motocross style jumps!